I noted back in October that there seemed to be something of a pause in the huge oil-drilling boom in the US. Going back to the data again today, it appears that the rig count in the US peaked in the summer of 2012 and has actually been declining since. Given the very high decline rates of the shale-oil plays that most of these rigs are drilling in, it seems this means that the US oil production increase will also have to slow sharply or stop in 2013/2014. Unless the rig count starts increasing again - it's not clear to me why it stopped, so it's hard to say whether or not the climb will resume. Is it possible that the implosion of Chesapeake Oil and replacement of CEO is the coalmine songbird for the industry? Possibly they are finding that it is harder to justify the cost, at current prices of course, than their initial enthusiasm justified. I've been keeping track of the Bakken oil stats page ( https://www.dmr.nd.gov/oilgas/stats/historicalbakkenoilstats.pdf ) in recent months. Today I noticed there is a massive drop in BBLs of oil in November. In recent years, oil has fallen off a bit in the winter, but nothing this big. Compare the EIA's weekly domestic oil production estimates to the more finalized monthly estimates. The EIA has been revising upward - often by substantial amounts - of the amount of crude being produced lately. 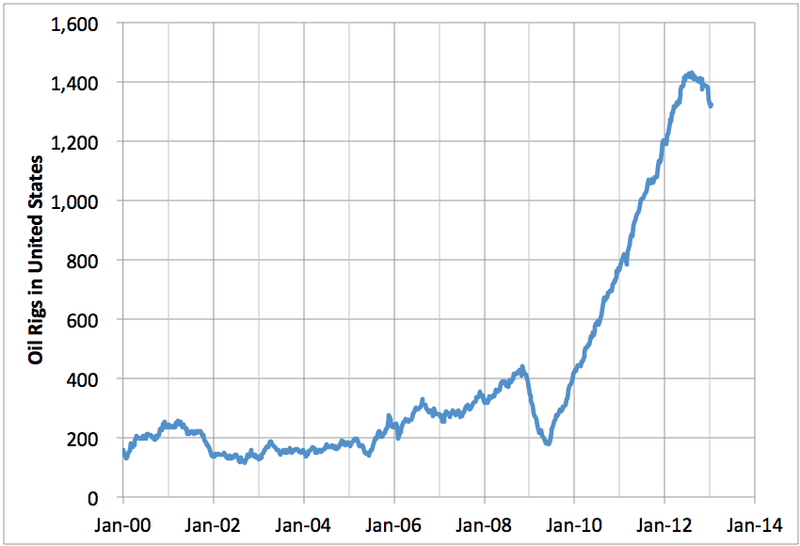 Ironically, this large upsurge in production is coinciding with the drop-off in rigs. But the reason for that is more efficient rig use. Read some presentations of some Bakken producers, for example, and you'll find out. Also, Lynn Helms' monthly comments on the NDIC page also explain the phenomenon. Probably the same is going on in Texas, Colorado and elsewhere. As for ND production, in the winter of '08-09, production went from 215,637 bpd in November to 187,733 in January, a decline of almost 13% (though back then, crashing prices certainly didn't help). In the winter of '10-11, ND production went from 357,043 bpd in November to 342,923 bpd in January, a decline of almost 4%. The decline this past November was just 2.2%. But given the weather up there lately I wouldn't be surprised to see more declines in recent months. Time to short oil price?
" ... it's not clear to me why it stopped ..."
The country is flat broke. Using (wasting) oil does not provide any organic returns and never has. Returns must be borrowed from finance ... which is also the provider of funds for the drillers. one bankrupt customer at a time! Couldn't happen to a nicer bunch of people, may they all rot in hell. 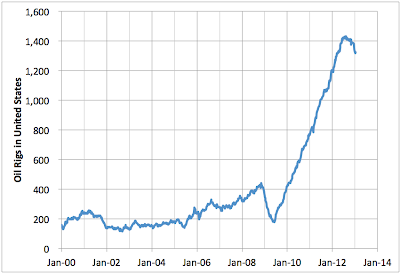 I've seen decline curves, a discussion thereof, and other details on shale oil. But I can't recall ever seeing an estimate of exactly how much shale oil there is to extract. Is this something that could go on for a long, long time? Or is the number of sites you can do this at limited? I'm pretty sure that the amount of oil that eventually comes from this method will be much less than we obtained from conventional oil, but does anyone have any estimates? The sky is falling, the Sky is falling. Ouch. Not really. Yes there was a decline. In both rigs and One month of Data. One would expect any downward trends to occur in winter months. Two things happened. Rigs are going down but actual wells started has increased. The field is moving from the held by production stage to the manufacturing stage. The efficiency of days to drill is constantly being pushed down by the operators. More holes per rig. This means less rigs need to meet available budgets. The next month showed an increase so it was a short lived down term. The other thing that is happening is that many of the driller are switching out the older style rigs to a new more effecient pad drilling model. This is also effecting the numbers. Also many big names are pursuing the eagle-ford play because frankly the numbers are better, thats what business does. However, The North Dakota government is working on reducing its taxes by 2% on oil production. If this is done I think rig counts will increase even more.